Reserve duty commanders protest outside Presidential Residence, urge Rivlin not to attend radical leftist conference in NY. 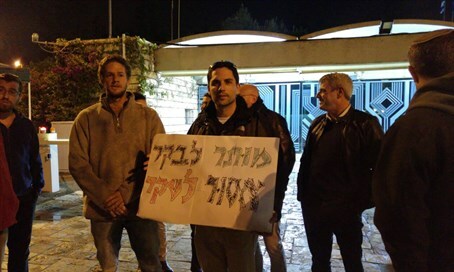 IDF reserve commanders held a protest on Saturday night in front of the Presidential Residence in Jerusalem, against President Reuven Rivlin's upcoming participation in a conference Sunday held by the leftist Haaretz paper in New York. Rivlin, who is in the US on a visit in which he already met with US President Barack Obama, is to take part in the conference together with "Breaking the Silence," a radical leftist group that frequently publishes false testimony against the IDF. Amichai Shikli, one of the organizers of the protest, told Arutz Sheva that "at a place in which people like Amira Hass, Gideon Levy and 'Breaking the Silence' appear - you can't give a speech there Mr. President." "Breaking the Silence" has been accused of inciting against Israel on the global stage by accusing it of "war crimes," has been caught accepting false "testimonies" allegedly from IDF soldiers, and admits it has no real vetting process for verifying which claims are true. Gideon Levy, editor of Haaretz, has frequently attacked the IDF for its defensive actions, while Haaretz journalist Amira Hass, who lives in Ramallah, has long justified terror attacks against Jews. Shikli told Arutz Sheva that he and another IDF company commander organized the protest for reserve soldiers and those serving their mandatory military duty alike. "Our message is very clear. The protest isn't against the president of the state, it's the exact opposite. The president is a symbol, an institution, and the president is extremely important," he said. "Tomorrow at the conference Amira Hass and Gideon Levy will speak. When we speak of the BDS movement, sometimes we think it's all ghost stories. No; Amira Hass is BDS, Gideon Levy is BDS, there is no one else. They are the engine of the delegitimization of the state of Israel," said Shikli. "They are the people who tomorrow night will be quoted by the New York Times, by the Washington Post, and due to them students on campuses in the US will go out and say 'the state of Israel is an apartheid state. The state of Israel commits war crimes.'" Highlighting the dangerous message sent by Rivlin's attendance, Shikli said, "you cannot give a stage to these people, you cannot give them the stamp of the Presidential Residence. That's our protest, we are not ready to see the president give a seal of approval to people like Amira Hass." "Amira Hass is like Bentzi Gopshtain, if you can go out against radical people on the right, you can go against ultra radical people on the left," he said, referencing the director of the Lehava anti-assimilation group that the courts vindicated as being legal during a highly publicized police crackdown. Shikli said of Hass and Levy: "they have nothing to do with left or right, they are simply against the state of Israel." "We, in the name of regular soldiers and reserve soldiers, come to tell the president of the state: 'please, know where you can't give a speech. You can't give a speech in a place where 'Breaking the Silence' speaks. Where Amira Hass speaks. This is not how you represent us.'" Video from the interview at the protest, in Hebrew, can be seen below.